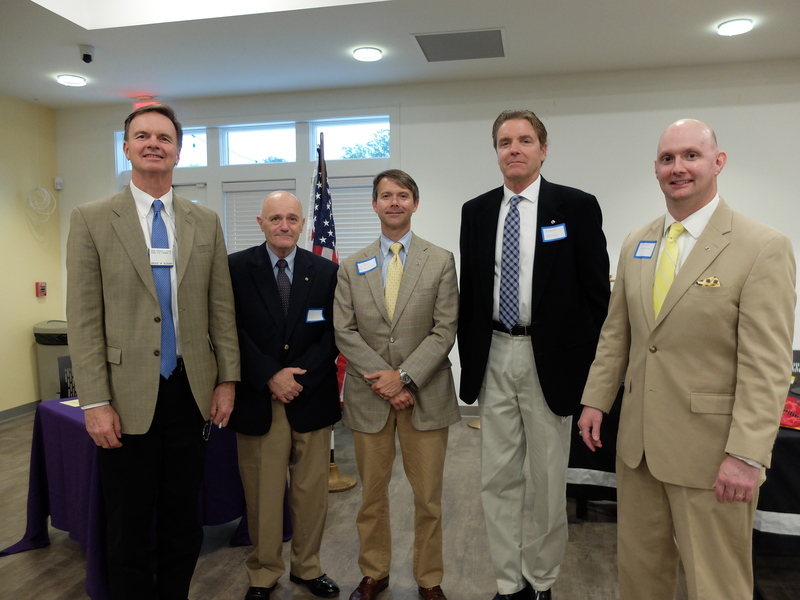 Pictured left to right are Bruce Slough, Membership Director, and new members Bill Cardullo, David Cal Whitehead, Steve Oswald and Brendan Mahoney. St. Bridget Knights of Columbus Council #5476 is pleased to congratulate four candidates joining the Order; they completed their First Degree initiation at St. Michaels on June 26, 2018. Please extend your congratulations to our new Knights when you have the opportunity! Per the below, our Director of Faith Formation, Donna Adler, is looking for volunteers to join our Rite of Christian Initiation of Adults (RCIA) team and/or serve as religious education teachers for young parishioners. RCIA: The RCIA team is a Tuesday evening weekly commitment, normally from 6:00-7:30pm (occasionally until 8:30pm) running from mid-September through Pentecost. RCIA team members would also be present at special Sunday liturgies for candidates and catechumens. RCIA team members accompany candidates and catechumens on their journeys by helping to incorporate them into the life of the parish and by being mentors in the faith, along with their sponsors. The RCIA team is expected to do the readings for RCIA sessions that we will require of candidates and catechumens. They should expect to spend up to three hours preparing every week. Catechist/Religious Ed: The pre-K through 5 program is also a weekly commitment on a Wednesday afternoon beginning around 4:00pm and ending around 6:15pm (taking into account set-up and clean-up time) or Sunday afternoons from around 12:00 to 2:00, also taking into account set-up and clean-up. Catechists should expect to spend one and one-half to two hours preparing for every session. Interested Brothers can reach out directly to Donna at dadler@saintbridgetchurch.org. Knights of Columbus Supreme Council has recognized our council’s “Good Works” . 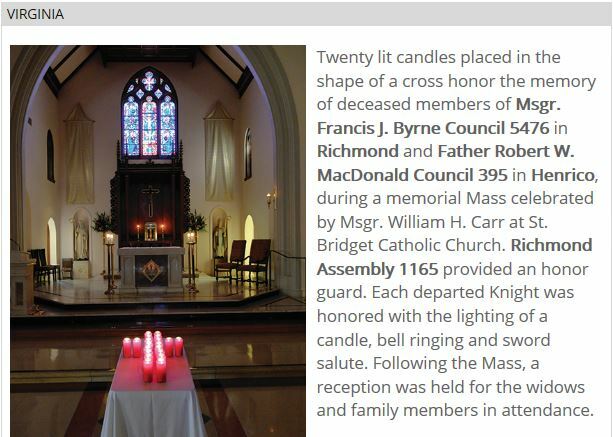 Our Mass of Remembrance has been posted digitally in the Virginia state portion of The Supreme Council’s “Knights In Action” website. Please enter Ctrl+Click on http://www.kofc.org/knightsinaction. link then go to the page 2 to see the council postings for Virginia. Our Scholarship Program posting is included on page 26 of the Columbia magazine, June edition. It is through the participation and dedication of our growing Council, now just over 100 men strong, that we continue to impact our St Bridget Catholic Church Parish. We also appreciate the wonderful support of our parishioners when the Knights are in action supporting a cause, or hosting a feast. This joint effort is what makes us ALL strong and successful. We cannot do our good works without all of you! The St Bridget Knights of Columbus Council 5476 had a successful weekend hosting Father’s Day Dogs 4 Dads, and collecting donations for KOVAR, Virginians with intellectual disabilities. It was a wonderful opportunity to serve the wellbeing of the parish through collaboration and fellowship. 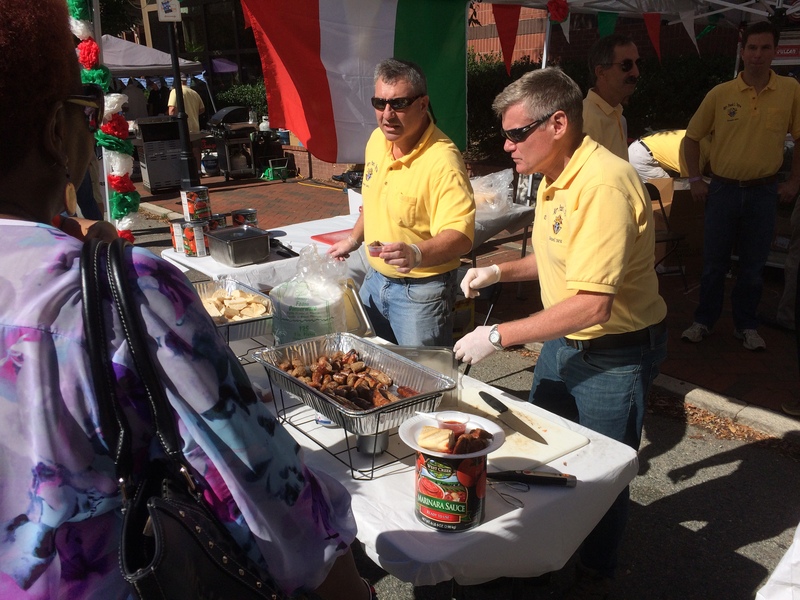 Thanks to Ron Paquette, his son and grandsons for cooking and serving up the best hotdogs in town; thanks to all the brother Knights who helped collect donations for KOVAR after each Mass. A special thank you to soon to be past GK Rick Witty for requesting an announcement before the 11:00 Mass. As John McCulla suggests, that helped. 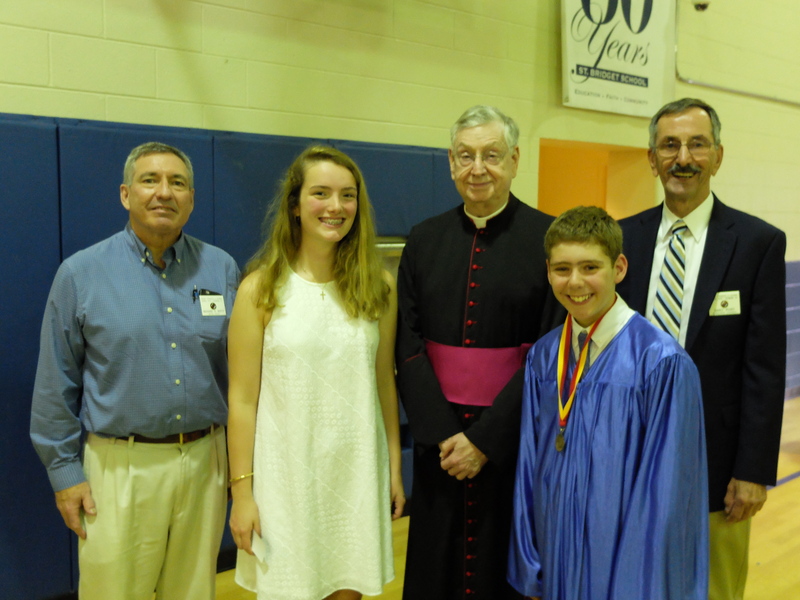 The Knights of Columbus are pleased to announce that their two annual $1,000 high school scholarship awards were presented at the St Bridget School Eighth Grade closing ceremony on June 4, 2018. Madison Page Kuriger will be attending St. Gertrude High School, and Tyler Craig will be attending Benedictine College Preparatory. Please congratulate Madison and Tyler for their success in winning this competitive scholarship award. St. Bridget Knights of Columbus Council 5476 has awarded this competitive Catholic High school Scholarship for the last five years. To date, the Council has presented scholarships to thirteen St Bridget school students who will be continuing their Catholic education in high school. Contact Gary Port for more information about his scholarship. Photo: Council Grand Knight Rick Witty, Madison Page Kuriger, Msgr. William Carr, Tyler Craig and Scholarship Chairman Gary Port.